With its upgraded low-profile console, the Lifecore LC850RBs recumbent exercise bike offers many the same features found in the high priced Lifecores, but costs just $999. The dual-color backlit LCD screen shows workout feedback for time, distance, speed, calories, and pulse readouts. 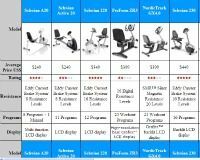 It has 12 workouts including 4 heart rate control programs including Target, 55 Percent, 75 Percent, and 90 Percent workouts. UPDATE:The 850RBs has been discontinued and replaced with the all new 860RB model. Check out our review here. The Lifecore LC850RBs features a contoured mesh seat back for lumbar support and an extra-wide seat bottom. The seat slides forward and back on a rail that locks firmly into place allowing you to choose the most comfortable distance from the pedals and the display. The drive belt is a Poly-V Flexonic belt is guaranteed never to stretch, and the 21-lb flywheel and magnetic braking system are all you need for a quiet, smooth workout. The console has a height of just 42" while most competitor models can be 52" or higher. This low-profile console allows you to watch TV without having to peer around the display. Other conveniences of this recumbent include a well-designed wire magazine holder on the front of the console, a water bottle holder, and oversized transport wheels. 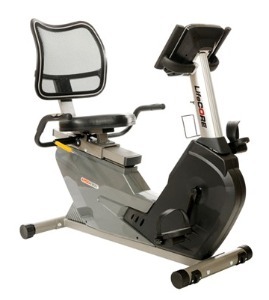 Like the more expensive Lifecore Recumbents, the LC850RBs exercise bike requires no plug-in cord or batteries. 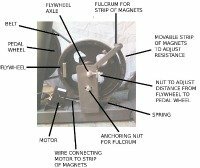 It has self-generating power, meaning you simple pedal and the screen display lights up. The adjustability on Lifecore exercise bikes is remarkable which is a deciding factor for households where users range in size from 5' to well over 6' tall. An important point to remember is that the frame on this model is 2-inches shorter than on the LC950, and that could be a factor for taller individuals with long legs. Overall, though, the specs and programs are the same. If you don’t want to spend over $1000, and feel that a compact footprint bike will be a good fit for you, the Lifecore LC850RBs recumbent exercise bike is an excellent choice.